Sportime Randall's Island and the John McEnroe Tennis Academy (JMTA) will be hosting the 3rd Annual JMTA College Recruiting Combine from Saturday, June 23 through Sunday, June 24. Long Island Tennis Magazine sat down with Jay Harris, the combine's Director and the Director of Tennis at Sportime Roslyn, to learn more about the event, how it started and why it is helping bridge the gap between high school players and college coaches. How did the Combine event come about three years ago? As a college coach at Brown University, I often recruited players from Sportime and frequently spoke to Mike Kossoff and Lawrence Kleger about the depth of talent here and how more of these players can get exposed to college coaches. So, when I joined Sportime myself in 2010 after a 16-year college coaching career, there was a natural niche for me to build where I could help put together a college consulting service and an amazing annual event to help hundreds of players navigate the arduous college search process. Can you explain a little bit about why high school tennis players would benefit from attending the combine? Very few high school players fully understand the competitive battlefield that exists for positions/scholarships on college tennis teams. Not only do they themselves need to create initial communications with coaches, but it is also very important for them to have their abilities showcased in front of the college coaches. These coaches are looking to make major investments by committing to players who will be a part of their program for four years and beyond; thus, seeing the way a player competes under pressure is a necessity for them to make these important choices. 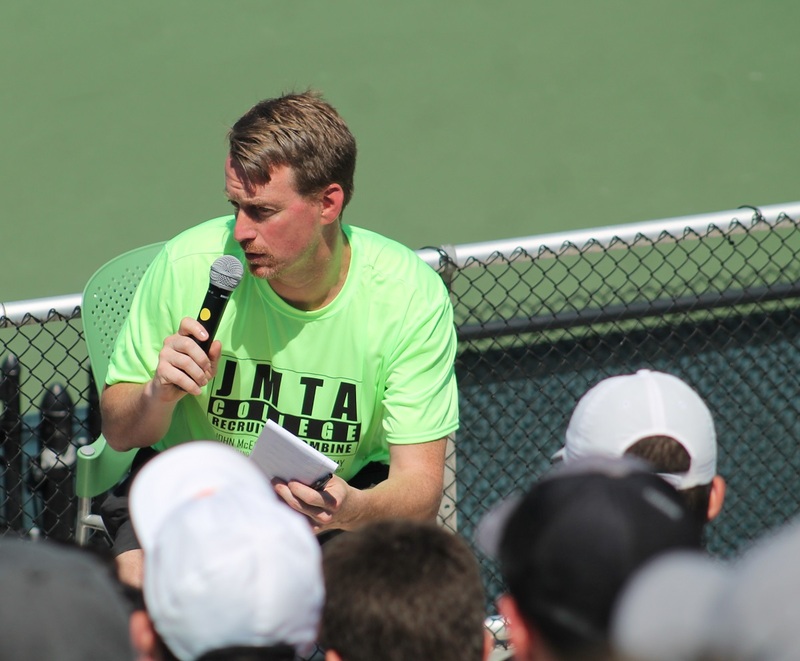 The JMTA College Recruiting Combine provides a perfect opportunity for this sort of exposure while creating an educational environment for the players and parents as well. What makes the JMTA Combine unique and different from the others? Our Combine is the most full-service recruiting experience in the country! We have top level coaches from colleges such as Penn State, Baylor, Dartmouth, Cornell, William & Mary, Yale, Mississippi State, Middlebury, UConn, Middlebury and many others, and we create a true Combine feel. Each player will compete in five matches (three singles, two doubles) on the weekend, and they will also participate in an intense fitness testing session run by the McEnroe Academy’s extremely talented fitness coaches. On top of all of that are our two seminars. The College Coaches’ Panel Discussion is probably my favorite hour of the weekend, as high school players and coaches have the opportunity to pick the brains of some of the most knowledgeable college coaches in the country on subjects like recruiting, how they run their team, and what it is like to be a student-athlete on a college campus. The second is our Sport Psychology Seminar, and this will include tips and discussion from the McEnroe Academy’s best mental coaches on how to become a better competitor and what it truly means to be mentally tough. Who is eligible to attend the combine? Space is limited to 60 boys and 60 girls entering their high school sophomore, junior or senior year in September 2018. Players from the New York Metropolitan Area, from across the USA, as well as from Puerto Rico, Greece, the Philippines and India have registered for the Combine. This will be the 3rd annual event. What new features/aspects have you added? Every year we look to take strides towards creating the best college exposure event in the nation. This year we have been able to attract more of the top coaches AND the top players in the country through more intensive recruiting efforts with both groups. For the first time, we are offering discounts for applicants with qualifying Universal Tennis Ratings: Boys 11.00 and above and Girls 8.00 and above. Also, we have a new Combine partner, CIZR, and they will be video-recording all matches and will offer participant packages, including edited match videos with detailed analytics, and a custom video player that lets participants quickly watch matches and share them with college coaches. What colleges have already committed to be in attendance? Our college coaching list is expanding every day! The current list includes Wake Forest, Cornell, Dartmouth, Penn State, Baylor, Yale, Brown, Penn, William & Mary, Middlebury, Williams, Bryant, Hofstra, UConn, Colgate, Villanova, St. Johns, Stony Brook, Union, Brandeis, Mary Washington, Brooklyn College, St. Lawrence, Oberlin, Wesleyan, the Citadel, Baruch, RPI, Stevens Institute of Technology, Queens College, Fairleigh Dickinson, St. Francis, LIU Post, NYIT with many more to register as the event draws closer. What can college coaches get out of the combine? College coaches attending the Combine will get the invaluable opportunity to watch top high school prospects compete at one of the most impressive tennis facilities in the world, Sportime Randall’s Island. This competition will have a tournament feel to it as players will be grouped into brackets and all results count towards their Universal Tennis Rating, so college coaches will be able to evaluate how players handle this sort of pressure. That, coupled with the opportunity to be a part of an event with John and Patrick McEnroe, is the perfect way to initiate a summer of recruiting for coaches from all parts of the country. To learn more about the combine, or to sign up, visit www.sportimeny.com/jmtacombine.